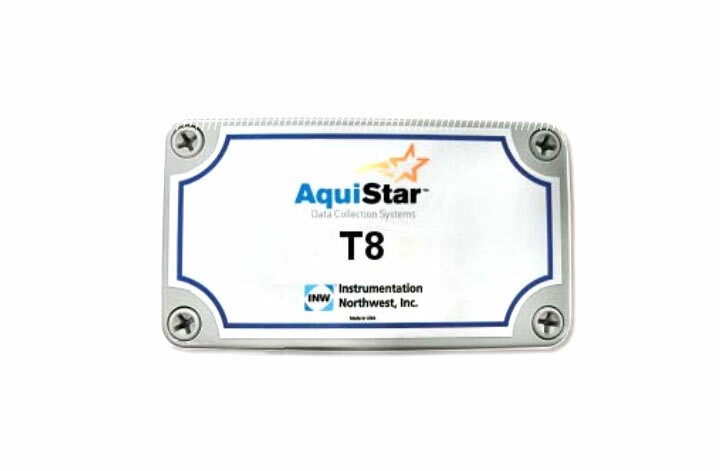 The AquiStar® T8 temperature string is a submersible multi-channel datalogger with multiple thermistors. The T8 temperature string is capable of storing over 52,000 records of temperature and time data, as well as operating on low power. It features easy-to-use software with powerful features. The T8 thermistor string consists of an internally powered, 8-channel recorder housed in a small weather-proof box. Thermistors are embedded in strings of multi-conductor cable, up to 8 thermistors per string. Several strings can be attached to a single control box, up to a total of 8 thermistors per box. Several T8s, or a combination of T8 temperature strings and other Smart Sensors can be networked together and controlled from one location, either directly from a single computer or through a wireless telemetry system. The T8 is powered internally with two AA batteries or can be powered externally with an auxiliary 9 - 13 VDC power supply for data intensive applications. The T8 temperature string comes with easy to use Windows®-based Aqua4Plus software providing the user with extensive control, including flexible programming, a delayed start feature, real time monitoring, as well as versatile data display options. A choice of Polyethylene, polyurethane, and Tefzel® cable options are available. Dimensions (box) 5.5" x 3.1" x 2.6"
(incl. connectors) 6.0" x 3.1" x 2.6"